"Cefazolin" is an antibiotic, semi-synthetic antimicrobial drug. The drug is available only in the form of powder for preparation of solution. "Cefazolin" is prescribed for the treatment of pneumonia, wound, burn infections, empyema, lung abscess, peritonitis, osteomyelitis, endocarditis, infectious-inflammatory processes in the urinary tract, infections of soft tissue, skin, bone and articular apparatus, and also to prevent postoperative complications. The drug is contraindicated in hypersensitivity to cephalosporins, pregnancy and lactation, in children up to one month. With prolonged use of the drug can cause vomiting, diarrhea, nausea, tachycardia, allergic reactions. In rare cases, prolonged use of "Cefazolin" were observed in renal dysfunction, hemolytic disorders. "Cefazolin" administered intravenously (bolus or infusion) as well as intramuscularly. Immediately before intramuscular injection of the contents of the vial should be diluted 5 ml of sterile water or sodium chloride solution. Make the injection deep into the muscle tissue. Before intravenously injection of a single dose of the drug should be diluted 8-10 th ml solution of sodium chloride. The drug is administered very slowly (4-5 minutes). For intravenous drip 500-1000 mg of the antibiotic is diluted with isotonic sodium chloride solution or 5% glucose solution (150-250 ml). In this case, "Cefazolin" you must enter within 30 minutes at a speed of 65 to 80 drops per minute. The daily amount of the drug for adults may reach 1000-4000 mg, it depends on the disease and severity of its course. When infectious-inflammatory diseases caused by gram-positive organisms, "Cefazolin" appoint 250-500 mg every 8 hours. For the treatment of infectious respiratory diseases caused by Streptococcus pneumoniae, as well as in infectious-inflammatory processes of mochevyvodjashie use 500-1000 mg of drug every 12 hours. When caused by gram-negative bacterial infections the drug is prescribed at 500-1000 mg every 7-8h. 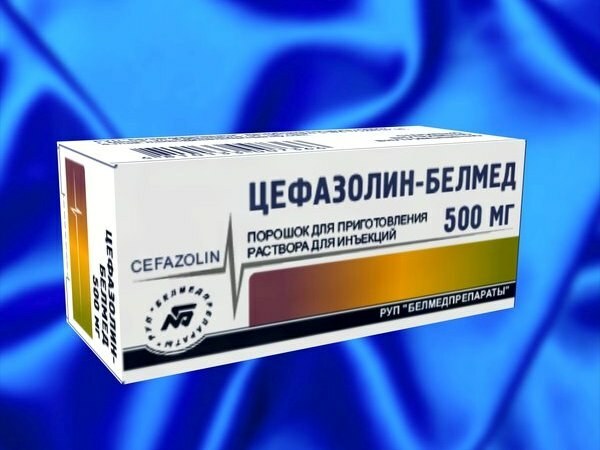 In cases of serious infectious diseases (necrotizing pneumonia, peritonitis, endocarditis, sepsis, urinary infection, acute hematogenous osteomyelitis) daily dose of "Cefazolin" increase to a maximum of 600 mg. the Interval between injections should be 6-8h. In children older than one month, the drug is used in the amount of 20-50 mg per 1 kg of body weight per day (in divided doses), and with very serious diseases - in the amount of 100 mg/kg.